Ce bel appartement de 75 m2, Belle Etage, est idéal pour une ou deux personnes et peut accueillir quatre personnes. L'appartement a des caractéristiques typiques de la fin du 19ème siècle, tels que le stuc, les portes battantes et les portes en bois originales. Il dispose de beaux parquets en chêne massif. La chambre à coucher est entièrement meublée avec un lit king size, un placard art déco et des étagères latérales. La salle à manger / salon dispose d'une longue table à manger E15 de 3 mètres de long et de 6 chaises Charles et Ray Eames. Les deux chaises super confortables Giancarlo Piretti créent un coin zen pour un café l'après-midi. La cuisine à éclairage naturel est très élégante, entièrement équipée avec un grand réfrigérateur et un congélateur séparé, lave-vaisselle, lave-linge, fer et planche à repasser, micro-ondes, four avec plaques chauffantes Ceran, cafetière, cafetière un canapé de designer qui se transforme en lit queen size. La salle de bain dispose d'une lumière naturelle, d'une douche de designer avec un grand porte-serviettes chauffant. Téléphone incluant les appels fixes européens / américains, Internet haut débit sans fil DSL. Il se trouve à une minute à pied du canal et à 4 minutes du quartier branché de Graefekiez. Les liaisons avec les transports publics (bus, métro) à Berlin sont excellentes! J'aime garder mon appartement propre et je recherche uniquement des sous-traitants matures et responsables. S'il vous plaît envoyez un courriel avec les détails de votre séjour et une brève description de vous-même. Enquête sérieuse seulement s'il vous plaît. If you want to be in a real Berlin neighbourhood with excellent public transportation to anywhere in town, this is the place to stay. It's quiet, sparkling clean, and perfect for a couple. The Landwehr Canal is just down the road, as are several eateries. And in the opposite direction you come to the really "happening" part of Kreutzberg, replete with restaurants, a wonderful market, and a great look at a Berlin neighbourhood. You will be met by a very helpful and pleasant woman, who will gladly direct you towards local grocery shops and provide information about tickets for the buses and U- and S-Bahns, and provide other information you might need. Perfekte Lage, sehr gepflegte und geschmackvoll eingerichtete Wohnung. I was really glad to host Susanna and her friend! Great guests with a respect to the house rules who kept the apartment in a respectful condition! I highly recommend them to every owner! I will happily host them again! Come back Susanna! Margaret and Sophia were very helpful and the check-in / check-out process were smooth and easy. I would definitely stay here again. It was a real pleasure to host Mr Nate Stoneman and his friend! He was a wonderful guest who took care of my property, polite, communicative and responsible! I highly recommend him to any owner and happily host him again! Come back to Berlin Nate! We spent 6 nights in this glorious apartment... and I truly mean glorious! There were a multitude of things about this flat that we appreciated. I will try to include as many as I can. First of all, the apartment is immaculate and both chic and comfortable. We have stayed in many apartments before and Sophia’s is exceptional. The bed: comfortable. The shower: pristine with plenty of hot water. The kitchen has everything you could possibly need. The giant table: quite practical, actually, for spreading out a multitude of travel information. And the little nook by the windows with the two comfy chairs: probably our favorite spot. Oh! And I haven’t even mentioned the magnificent ceilings. Their height truly added to the charm of this apartment. The location is wonderful. You can catch the 41 bus right in front of the apartment which takes you to a multitude of sights and other forms of transport. Corner store a block a way, as is A Horn, a breakfast-lunch-dinner place, that is charming, reasonable and where my husband took his mocha hot chocalate everyday. Sophia is a model host. She regularly got back to me about any and all of my pertinent and silly questions. (“Where is the toaster?”) When our flight to Berlin was unexpectedly cancelled as we were going out to catch a cab to the airport, I frantically emailed Sophia of our change of plans, and heard back from her quickly. I highly reccommend this apartment and we hope to stay there again when we next return to beautiful Berlin. I wish Nancy and Jeff to rent my apartment permanently or for the most part of the year when I am not in Berlin! There is only one word I could use: Wonderful! Wonderful guests, very considering, careful, communicative, respectful! I highly recommend them to any owner! Nancy, I'll buy a toaster to make sure to have it there for you for the next time you visit Berlin! 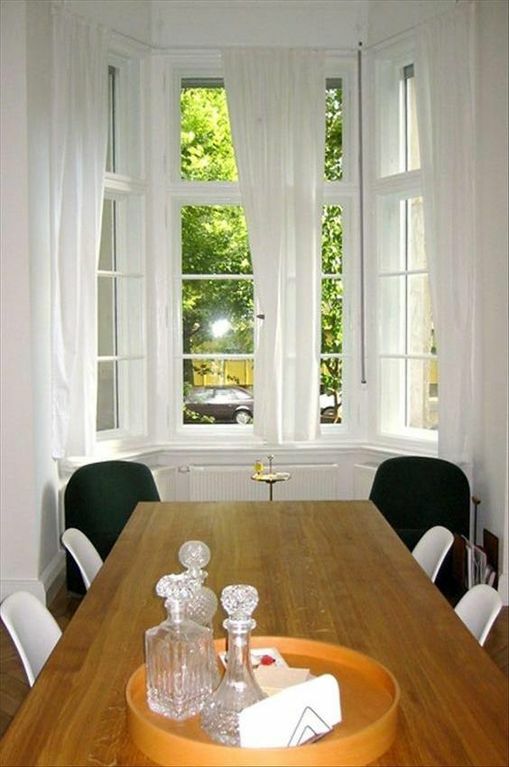 A gem of an apt in Kreuzberg!! Our family of three loved our week long stay at Sophia's apt and highly recommend it. Sophia's communications were efficient, timely and informative (including great restaurant suggestions). The location is perfect for getting around Berlin whether it is by bike, bus, subway or walking. We chose to mostly bike and walk--there is a courtyard for easily storing bikes. Upon our arrival we were greeted by Margret, a lovely woman, who got us acquainted with the apt. She even emailed us later in the week with bus times for to the airport for our flight home!The apt has every amenity you could want including a well equipped kitchen. The apt is quiet, sparkling clean, very comfortable and light from the tall windows. The beds are so comfortable, making it easy to fall asleep after long days of touring around. There are several grocery stores within easy walking or biking distance, including a convenience-type store within a block. The apt is within 2 blocks of the canal for strolling,going for a morning run (which I did) or walking to a nearby bridge in the evening to hear local musicians. We hope to stay here again when we return to Berlin someday!! It was a real pleasure to host Suzzane and her family! She respected every house rule, took care of my property and the commonucation was smooth and efficient from the beginning. I highly recommend her to every owner and I invite her to stay at my place again if life brings her back to Berlin! Appartement superbe. Je le recommande vivement. L'appartement est magnifique, tranquille et très frais (malgré la canicule à l'époque de notre séjour). I was really delighted to host Pierre and his family! They all were wonderful guests with respect to the house rules and easy to communicate! I highly recommend them to every owner and I will gladly host them again! Pierre come back to Berlin! Canal est à deux minute à pied de l'appartement. Parfait pour manger, marcher, se détendre, bronzer, lire.